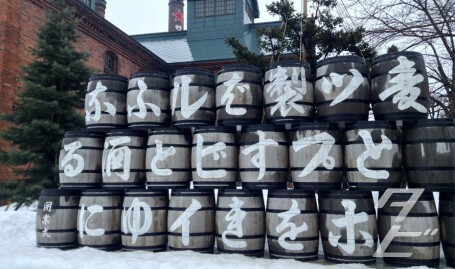 During my jaunt to Hokkaido last month, I got the chance to visit Sapporo Beer Museum and learn all about Japan’s oldest beer brand! 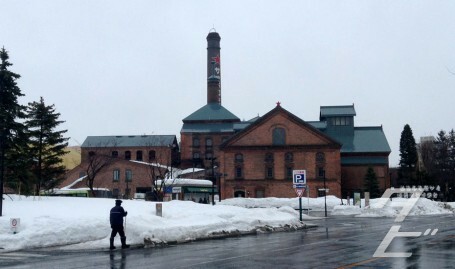 Founded way back in 1876, Sapporo Beer is now produced and sold all over the world, but Hokkaido is where it all started. 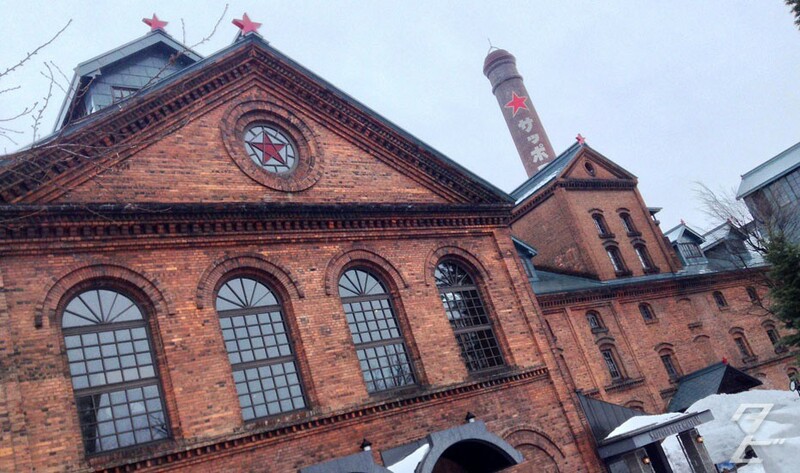 The Beer Museum is located about 15 minutes from the city centre, it’s a fantastic red-brick building which was originally a sugar factory, then re-purposed into a brewery around 1903, and it’s been a museum since 1987. 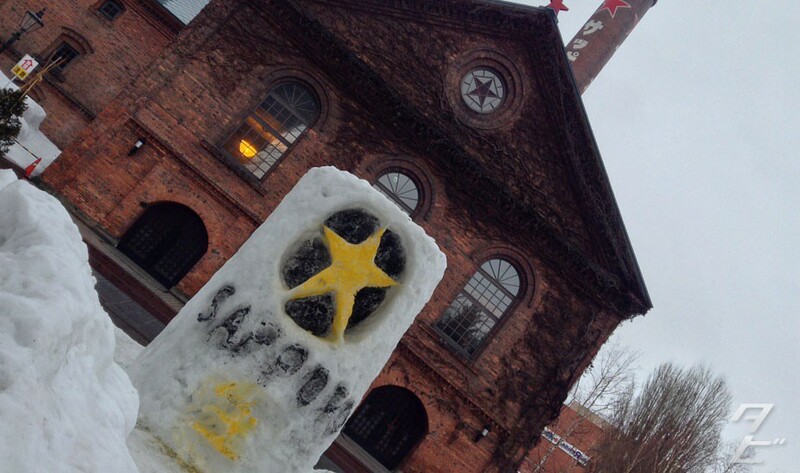 As with much of the city, there were massive piles of snow everywhere but the ground staff were putting it to good use, creating little snow sculptures featuring the companies signature north star. Entry to the museum is free, and they have lockers inside so you can ditch all of your heavy outdoor clothing for a bit. 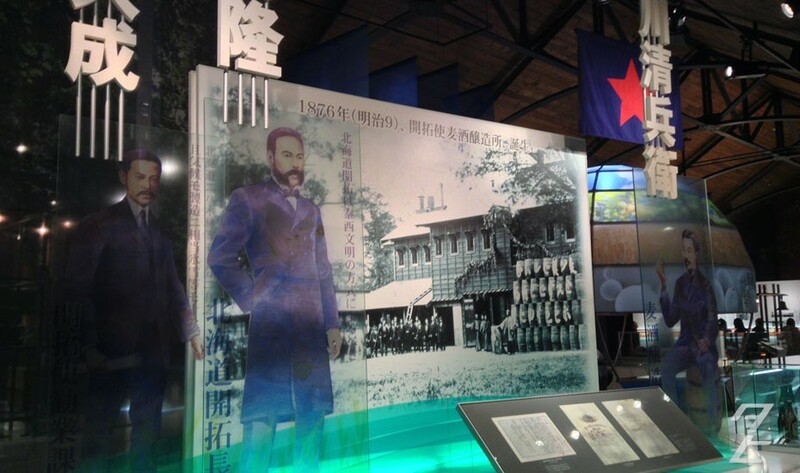 There are English translations of the exhibit information available and all the staff we met spoke pretty well. 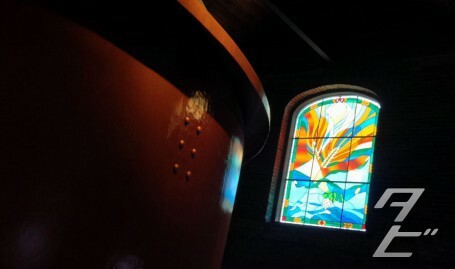 The tour begins on the third floor, and guides you downstairs to the beer hall. Firstly you’re introduced to the founders and history of the company before moving on to the beer making process. 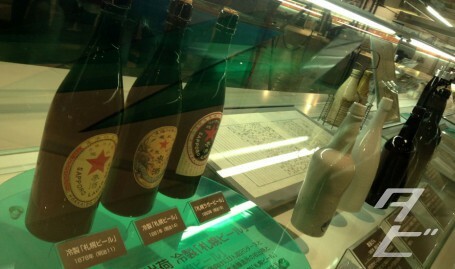 It’s a very modern museum with a variety of exhibits, with lots of interesting pictures and models as well as plenty of classic bottle and logo designs. I loved seeing all the classic logos as they’re so different to today’s trend towards simple, flat design. 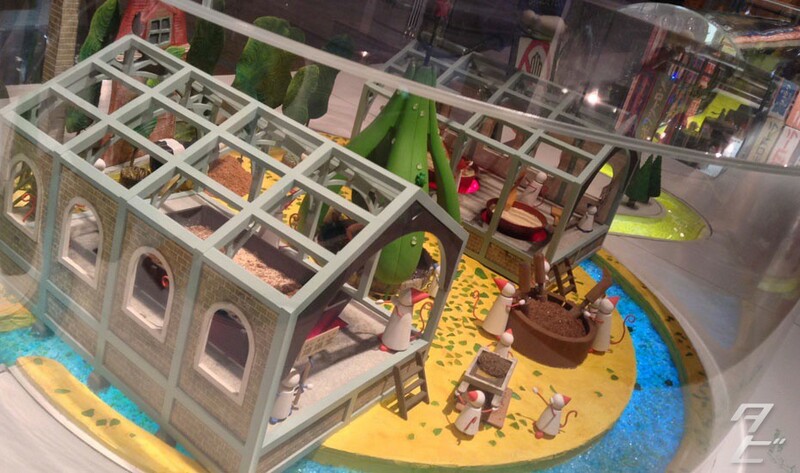 Mini brewery staffed by strange party-hat wearing, tailed mini people! 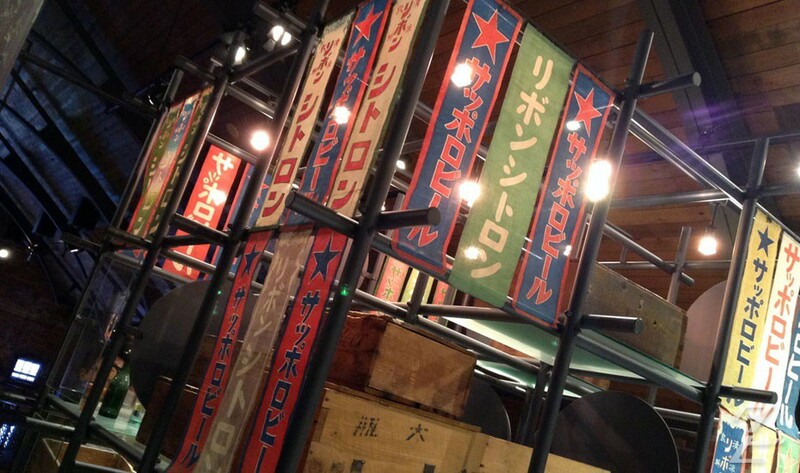 More classic design in the form of hanging banners. 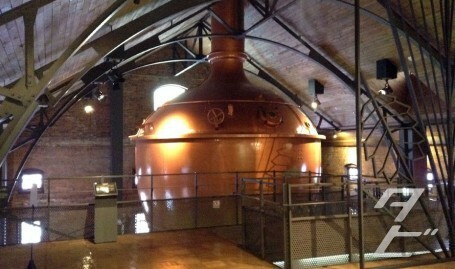 Gigantic copper kettle once used for making beer, goodness knows how many pints this thing produced when it was in service! A spiral staircase wound around the kettle, leading to the second floor. More classic signs, look at that dapper chap! 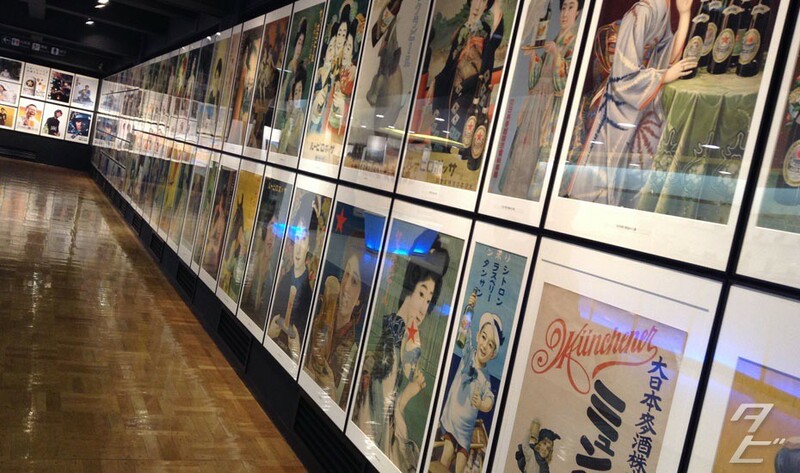 The second floor was full of classic posters, stretching from way back to modern day. 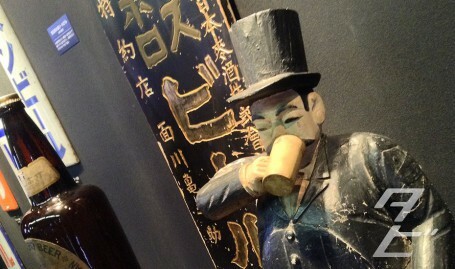 Fantastic artwork, I’ve seen posters like this displayed in tachinomiya (standing bars) in Osaka. 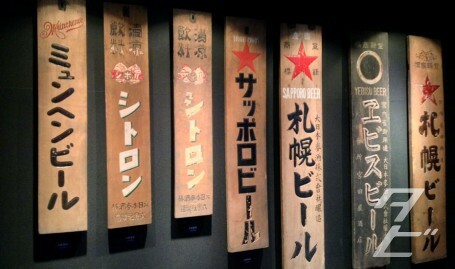 Finally, you’ll descend into the beer tasting hall, where you taste a number of different Sapporo beers! 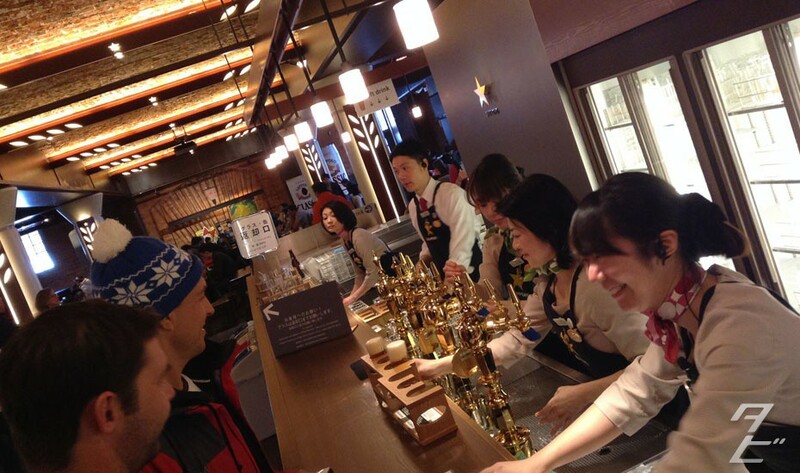 You can buy them separately or a tasting set of three for ¥500, easy choice! Tah dah! 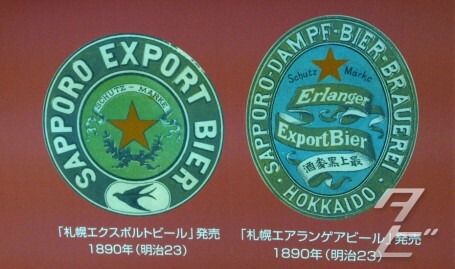 The three beers you can try are: Black Label, Classic and Kaitakushi. 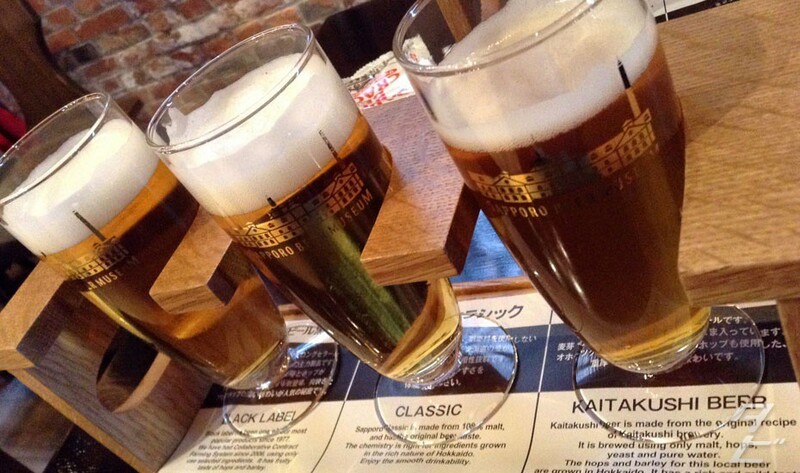 I enjoyed all three, Black Label is the norm, Classic was light and refreshing and Kaitakushi has a delicious, full taste. 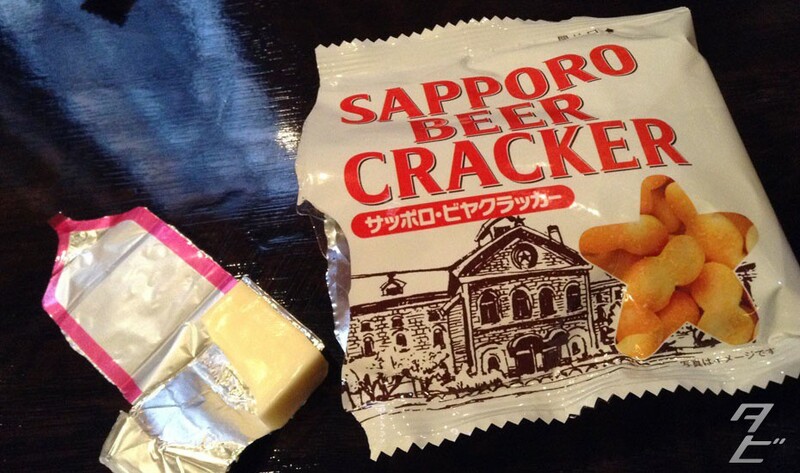 All washed down with these delicious snacks, Hokkaido cheese and Sapporo beer crackers! You can keep ordering drinks but bear in mind there’s a 30 minute time limit, although on quieter days I really doubt they’d enforce it. 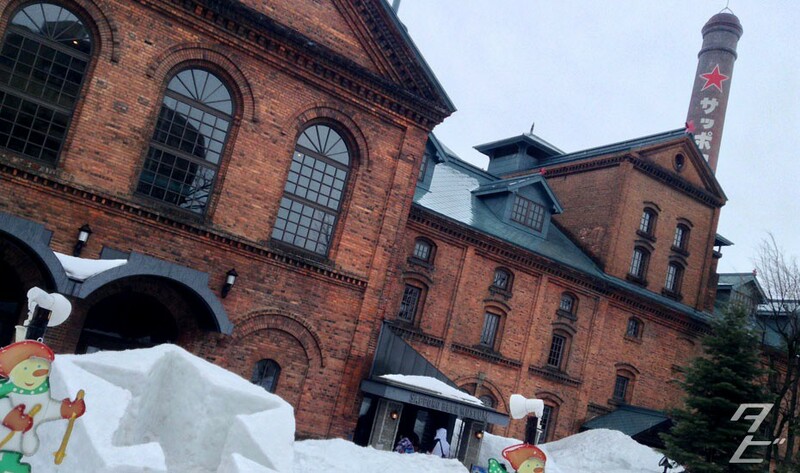 We finished our drinks and headed back out into the cold, and found one more sculpture – this gigantic snow beer can! 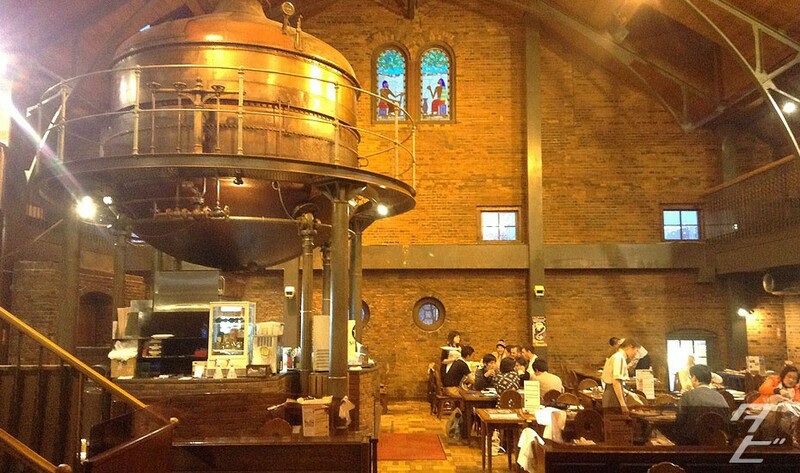 We were getting peckish and had heard the beer museum had another hall with all you can eat food and drink, so we went to the information desk to reserve a table. 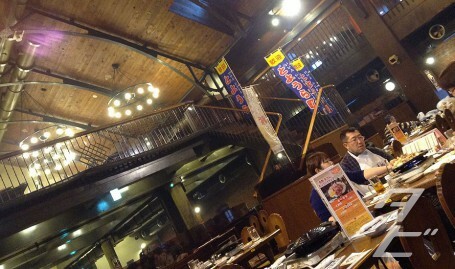 This is the Kessel Hall, where you can enjoy all-you can eat Genghis Khan mutton with vegetables and beer! 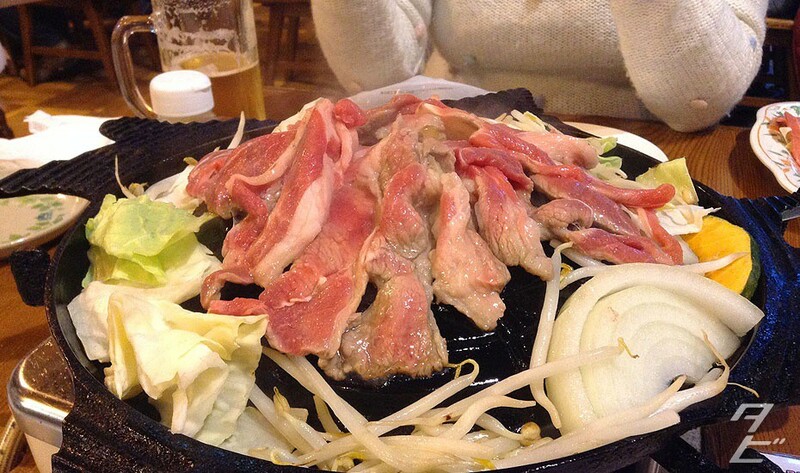 It costs ¥4500 for 90 minutes and you cook it at your table, yakiniku style. You’re supplied with bags to put all your stuff in so it doesn’t stink for days after, a nice thought but trying to get all my stuff into the bag was comically messy. It’s. So. Good. You place the meat in the centre and the vegetables around the sides so they get marinated as the meat cooks. I will never admit how much I ate. 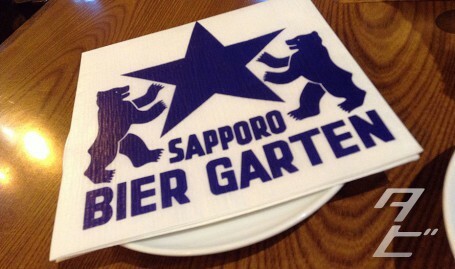 Paired with jugs of Sapporo, this was a great meal for our first night in Hokkaido!